Christmas is truly a magic time. The spirit in the air, the giving and sharing of love, the beautiful lights and scents . 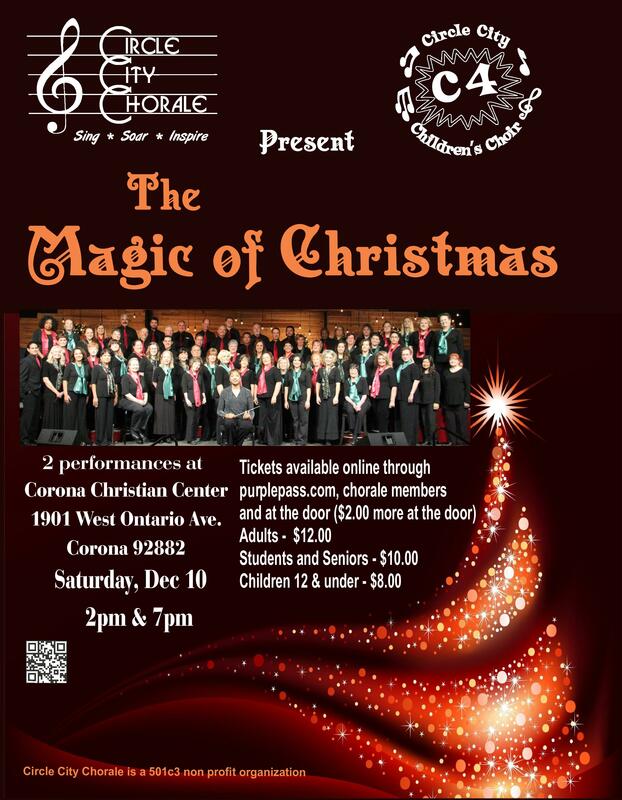 . .
Come share the magic at the Circle City Chorale’s wonderful holiday show, The Magic of Christmas. Three choirs – the full 65-member chorale, the smaller Circle City Singers ensemble, and the 30-member Circle City Children’s Choir – will perform standard favorites, modern renditions of classic songs, and and some less familiar but no less inspiring melodies. This is always an exciting and touching musical concert filled with the hope, joy, and magic of the season. The Circle City Chorale, under the direction of Angela Rosser, was founded in January, 2010, with about 30 members. Over the years, the Circle City Singers and the Circle City Children’s Choir have formed as well as the full Chorale growing in size and spirit. Our motto is Sing, Soar, and Inspire. This concert will personify that spirit! Come and share the magic!